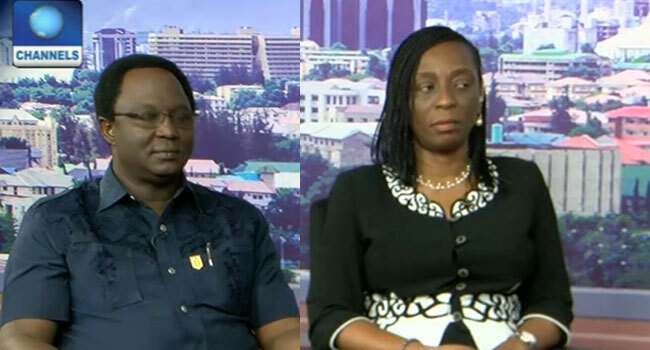 Director of Trade Union Services at the Ministry of Labour, Mrs Omabie Akpan, and NLC President, Mr Ayuba Wabba, spoke on the matter when they appeared on Sunrise Daily, a Channels Television’s breakfast show. Following the impasse in the new minimum wage, Mrs Akpan insisted that the government would implement the “no work, no pay policy”. “They (Federal Government) are just implementing the policy now, the policy has been in existence since 2004,” she said. According to the government official, it is wrong for labour leaders to embark on an industrial action while negotiations are ongoing. NLC President, Ayuba Wabba, and the Director of Trade Union Services, Ministry of Labour, Mrs Omabie Akpan. Mr Wabba, however, gave a different opinion, arguing that it was the fundamental right of workers to proceed on strike as enshrined in the labour laws. He stressed that the rights of the Nigerian workers must be protected, as they are what separate them from slaves. “The rights to strike is a core trade union and human rights and that is why our laws recognise the rights of a worker to a strike,” the NLC president said. The disagreement between the government and the labour body comes three weeks after the organised labour called off the nationwide strike it embarked upon in September. Wabba explained that the industrial action was due to the refusal of the government to reconvene the meeting of the Tripartite Committee to enable it to conclude its work on the new national minimum wage demanded by workers.